The astronaut and the robot are three thousand kilometres apart. 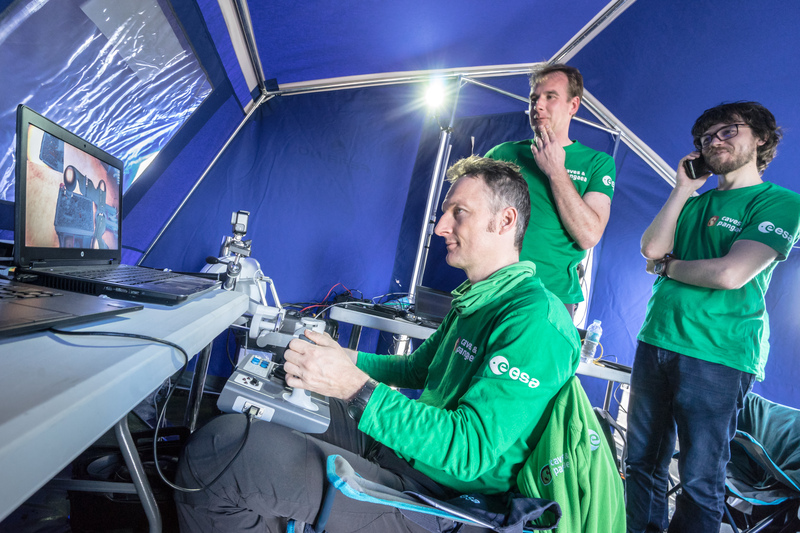 Joystick in hand, with no wires to be seen around the simulated Moon base, ESA astronaut Matthias Maurer commands a rover relying on a video feed. He can see and feel the rover’s interaction with the environment while his robotic team mate collects rocks across the Atlantic Ocean. 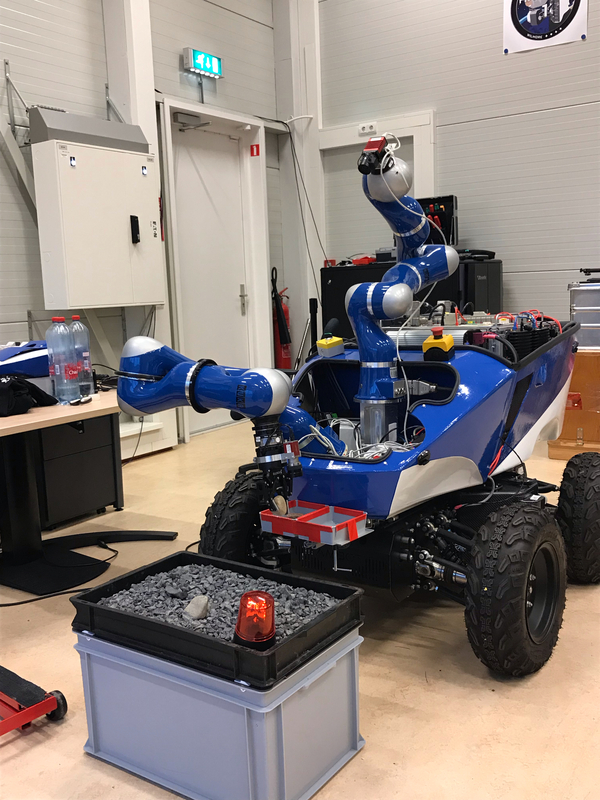 This was a first for Matthias, but also for the robot, obeying his commands at ESA’s main technology centre in the Netherlands. Teleoperations between astronauts and robots are nothing new – ESA astronaut Alexander Gerst controlled the Rollin’ Justin robot from the International Space Station earlier this year. It is the lack of available networks in Lanzarote’s National Park, in Spain, that makes it a new feat for the ESA engineers taking part in the Pangaea-X campaign. Previous tests from the Space Station to ground were performed in laboratory conditions, with well-established communications links and well-understood space-to-ground network delays. In Lanzarote the team deployed a large antenna on the top of a mountain to guarantee a good cellular connection, the same you use for chatting on your phone or watching online movies. The team worked hard to provide a good user experience and minimise the 100 ms communications delay from Lanzarote, less than the blink of an eye. “It might sound insignificant, but humans are very sensitive to time delays,” explains Thomas Krueger from ESA’s Human Robot Interaction Lab. The average time delay from the Space Station to ground and back is almost a second. There were some loss of signal and delays of up to two seconds during the first run, but Matthias felt at ease at the controls. “Robot operations in these conditions are quite challenging. Video and force feedback need to be synchronised as much as possible,” says Thomas. Since it was raining in the Netherlands, the rover used was a water-proof version of the Interact Centaur rover, initially designed to help humans build a base on the Moon as part of the Meteron project. Interact has two cameras, one on the top that turns around and another one on the arm for collecting rocks. “The robot is an avatar for the geologist, his eyes and arms in a remote location,” says Thomas. This test is part of the Analog-1 experiment that ESA astronaut Luca Parmitano will run next year from the International Space Station. Luca will operate the rover from orbit. The Centaur will scout terrain in Lanzarote, collect interesting rocks and bring them back to a simulated lander. “We will be recreating a Moon scenario,” explains operations lead Misbahur Rehman Saad. “We will monitor the interaction between ground teams and the astronaut on the Space Station, and also how the robot copes with the hazardous terrain,” he adds. From the Space Station Luca will have ground support from the European Astronaut Centre in Cologne, Germany. This central node, together with the European Space Operations Centre in Darmstadt, will receive video, audio and data about the health of the rover. The signal will journey from the International Space Station to NASA’s White Sands in the USA, to continue to the Columbus Control Centre in Oberpfaffenhofen and to the European Astronaut Centre, in Germany, to finally arrive to Lanzarote. Results will feed into ESA’s contribution to the space Gateway, a testing ground for the challenges of long-duration human missions. There is also a potential for applications on Earth. Teleoperated rovers like this one can carry out surveillance missions in disaster areas or remote locations where it is too dangerous for humans to access.